The trailer to this movie pretty much sums up the whole experience. Mark Wahlberg & Denzel Washington, plenty of arguing, one-liners, attitude and lots of shooting .. no bad thing I hear you say and for the most part it isn’t. This is a fun romp, with double-crosses a plenty and a nippy script that doesn’t worry to much about a cohesive narrative or characters with much depth. Apparently based on a comic book series by Steven Grant, we also get Bill Paxton turning up as a sneering bank owner who’s feathers are ruffled after Wahlberg & Washington steal $42 million from it, unaware that its all mob money. As the trailer revealed, the two leads are actually under cover agents, even if at first they don’t realise the other is … which is an interesting spin and Wahlberg & Washington give it their all. 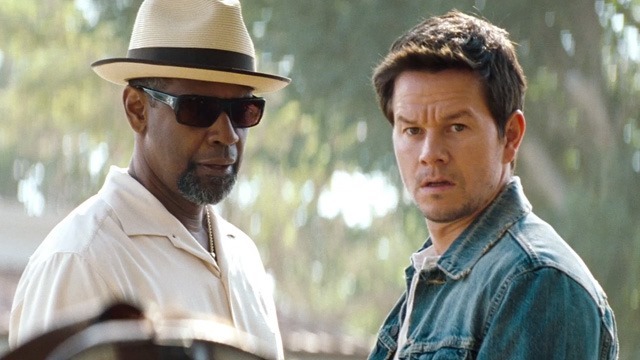 Denzel of course could do this sort of role in his sleep but is still very watchable, and the increasingly enjoyable Mark Wahlberg manages to make an arrogant womaniser just as likable. Token babe Paula Patton is on hand to be the eye candy, basically to give the guys something to look at amongst the ample-dose of machismo. So what we have here is a stylish and energetic caper, making for a light, fun ride with a likable cast … but sadly little else to shout about. This entry was posted in Blu-Ray, Comedy Reviews, Movies, Reviews, Thriller Reviews and tagged 2 Guns, Bill Paxton, Denzel Washington, Mark Wahlberg, Paula Patton by Craig M. Bookmark the permalink.